Most people are probably familiar with Adobe for developing the PDF file format and associated free reader. Adobe also created Photoshop, a graphics/photo editing software so prolific that is has achieved action verb status ("That model was Photoshopped") in the same way that people "Google" something where searching online. 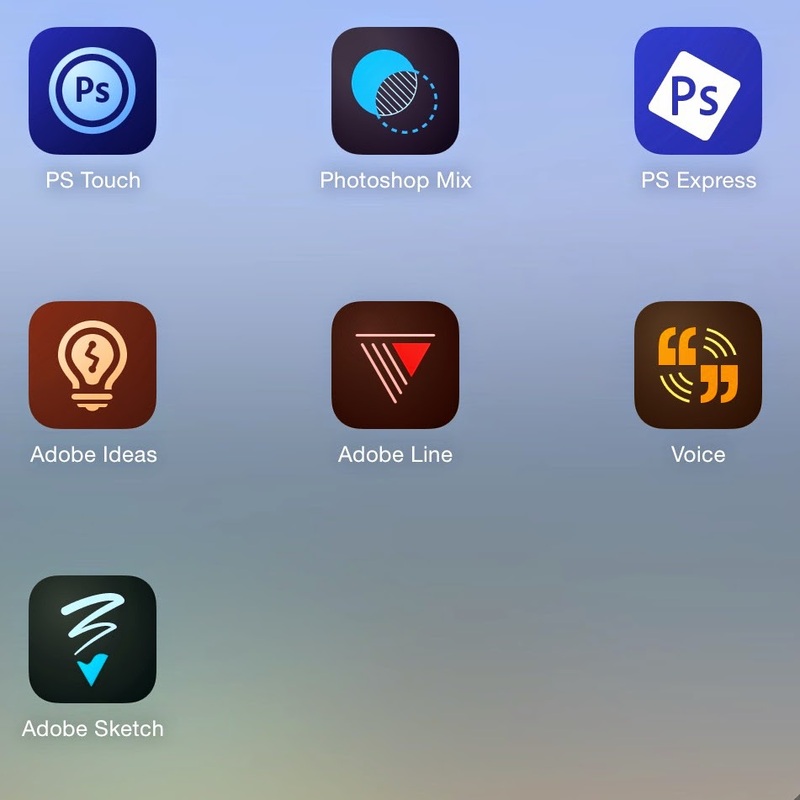 Like many companies, Adobe has moved into the mobile app market for both Apple (iOS) and Google (Android). Several of the apps are free. Below is my SlideShare review of several of the apps. I like the control of saving finish products to my device. If I edit a photo, I want to see it in the photostream. Likewise, if I create a video, I want the flexibility to upload to the video platform of my choice (YouTube, Vimeo, Screencast, etc.). Unfortunately, many of the Adobe apps require you to use the Creative Cloud (different from Apple's cloud). 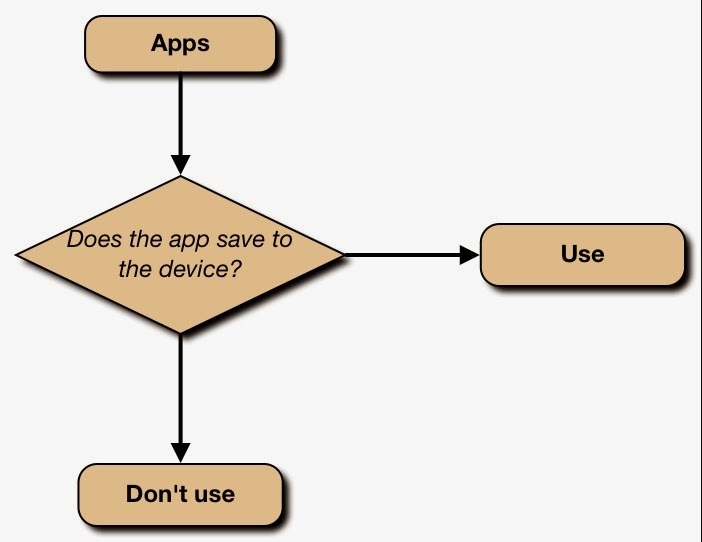 For that reason, I created a small flowchart to illustrate when I would use an app and when I'll take a pass. All of the quoted passages are taken from the descriptions of the apps in the Apple app store. Adobe Photoshop Touch "for iPad lets you combine images, apply professional effects, and share results through Facebook and Twitter - all from the convenience of your iPad." I use this app extensively to create graphics, edit pictures, create pictures with transparent backgrounds, and much more. There are several editing features including layers, effects, and selection tools. This is as close as you can get to Photoshop on the iPad. Adobe Photoshop Express is "photo editing made fun, fast, and easy. Touch your way to better-looking iPhone pictures using slide bar adjustments, or let automatic one-touch fixes do it for you. Share with friends and family on Facebook, Instagram, or text/email." This app provides several filters and effects. One feature I particularly like is the "straighten" feature which allows you some creative freedom to angle photos. Additionally you can flip photos. Adobe Photoshop Mix "combines the power of Adobe Photoshop software with the convenience of mobile for a creative, easy-to-use photo editing experience on your iPad. Non-destructive photo enhancements, selections, the ability to cut out and mix images, and more." I was unfamiliar with this app until researching apps for this post. The primary feature of interest for me is the ability to crop out areas of one photo to overlay on a different photo. However, I will probably continue to use Photoshop Touch to accomplish this, as it has more capabilities. 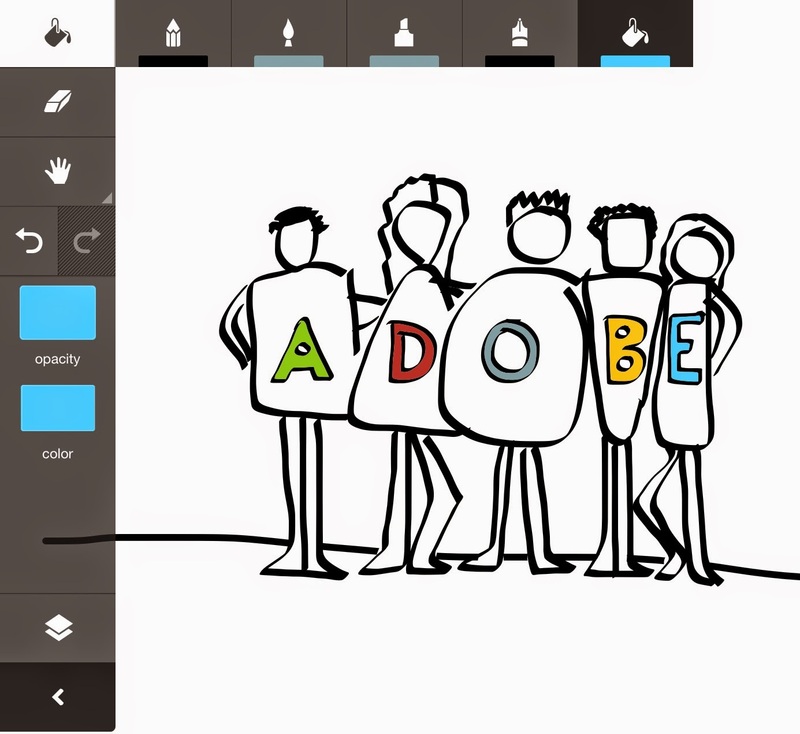 Adobe Ideas "gives you the ability to draw freeform vector illustrations where you are. Replace your pen and paper with a huge virtual canvas, customizable brushes, and pressure sensitive stylus support." This is a great app to quickly sketch out a design or illustration. I have used this as a collaboration tool for process maps as well. There are a variety of pen types (pencil, highligher, pen, and fill) and the ability to use several layers of drawing. You can also import a photo layer. Frequently, I import a photo of a grid in order and to keep some scale to my illustrations. You can simply hide this layer when exporting the finished picture. Adobe Sketch "brings inspiration, drawing, and your creative community together in one place. Capture your ideas as sketches and share them on Behance for instant feedback. Sketch gives you the freedom to find inspiration, explore ideas, and get feedback from trusted peers." Requires use of Adobe's Creative Cloud. Uses finger swipes for undo and redo (as opposed to including an undo button). Appears to have limited adjustments for brush sizes. Adobe Line, "a modern approach to drawing and drafting, Line lets you draw straight lines, geometric shapes, perspective views, and more." This seems like an app with a lot of potential. However, it requires use of Adobe's Creative Cloud. Line has the same functionality as a traditional drafting table, with a sliding ruler and the ability to incorporate a stylus (also available from Adobe). Adobe Voice "helps you create stunning animated videos in minutes. No filming - just talk to tell your story. Pick from over 25,000 beautiful iconic images to show your ideas and Voice automatically adds cinematic motion and a soundtrack. Persuade, inform and inspire anyone online. Make an impact." Like Line, this seems like a great app. However, once again, it requires use of the creative cloud, and you cannot save the finished videos to your camera roll - you must view the videos online. There seem to be limited undo options and very limited adjustments to the arrangement of text and image movements. Vittle and iMovie include the basic functionality of Voice. Only the ability to select from stock photography and icons is missing. What creativity apps do you use? Comment below. If you found this review helpful, please share on Facebook, Google+, or Twitter. Nice app. I like it. Thanks for sharing. Very informative post, thank you! Did you try https://macphun.com/ for editing your photos?? My friend recommended it, he said it has a simple interface and a lot of filters.